A pair of bipartisan senators on Wednesday announced they've reached an agreement over a bill to expand background checks for gun sales, marking a significant first step as Congress attempts to tackle the thorny issue of gun control. While the Senate is now one step closer to actually voting on the legislation, the bill's fate remains far from certain, its authors acknowledged. "I think this is a fluid situation, and it's hard to predict," said Sen. Pat Toomey, R-Pa., one of the drafters of the background check bill, said of the legislation's chances. He added, however, that the legislation represents common ground and that he's "hopeful" it can pass. "Criminals and the dangerously mentally ill shouldn't have guns," Toomey said. "I don't know anyone who disagrees with that premise." Toomey and Sen. Joe Manchin, D-W.Va., told reporters Wednesday that they have reached an agreement with Sens. Mark Kirk, R-Ill., and Chuck Schumer, D-N.Y., on the legislation, which would expand background checks to cover firearm sales at gun shows and over the Internet. When the Senate votes this week to begin debate on gun legislation, their bill will be the first amendment up for consideration, Manchin said. The push for new measures to reduce gun violence was sparked by the December shooting in Newtown, Conn., which Manchin said "changed us all." "This amendment won't ease the pain... but nobody here, not one of us in this great capital of ours in good conscious could sit by and not try to prevent a day like that from happening again," he said. 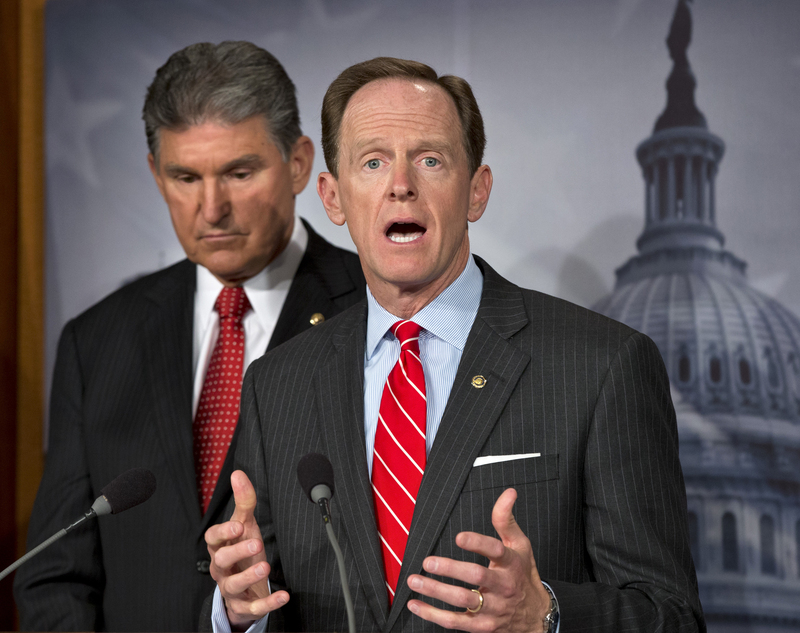 Manchin and Toomey both receive high marks from the National Rifle Association, which should help make their legislation more palatable to both Democrats and Republicans concerned about looking soft on Second Amendment rights. Of all the proposals up for consideration, expanding background checks may have the best chance of passing because of the overwhelming public support behind the idea. "I don't consider criminal background checks to be gun control -- it's just common sense," Toomey said. When asked whether he was concerned about losing his strong rating from the NRA, he said, "What matters to me is doing the right thing, and I think this is the right thing." The senator added that most Pennsylvanians would agree with him. Manchin said, "Back home where I come from, we have commonsense, we have nonsense and we have gun sense." Soon after Manchin and Toomey announced their agreement, the NRA released a statement in opposition to it. "Expanding background checks at gun shows will not prevent the next shooting, will not solve violent crime and will not keep our kids safe in schools," the statement said. "The sad truth is that no background check would have prevented the tragedies in Newtown, Aurora or Tucson." Though the background check bill will be the primary piece of legislation up for a vote before the Senate, another pair of bipartisan senators announced they have reached an agreement -- with the blessing of the NRA -- over another proposal to crack down on illegal gun trafficking and straw purchasing. Sens. Patrick Leahy, D-Vt., and Susan Collins, R-Maine, said they won NRA support for the Stop Illegal Trafficking in Firearms Act after making modifications, including language to ensure that lawful gun purchasers can buy firearms to give as bona fide gifts. "Senator Collins and I are both strong supporters and advocates of Second Amendment rights for law-abiding Americans. We also agree that our law enforcement officials deserve our support in their efforts to keep guns out of the wrong hands," Leahy said in a statement. While a group of Republicans vowed to filibuster any gun legislation, it appears they don't have the votes to stop the debate from starting on the Senate floor, which Senate Majority Leader Harry Reid, D-Nev., said could start as early as Wednesday. After the bill is debated and amendments are considered, the Senate will again need to get 60 votes to end debate. Then it would need a simple 51-vote majority to pass the bill before sending it to the House, where its fate is unclear. House Speaker John Boehner, R-Ohio, on Wednesday declined to say with certainty whether or not the House would even put it up for a vote. "Any bill that passes the Senate, we're going to review it," Boehner said. "In the meantime, we're going to continue to have hearings looking at the source of violence" in the U.S.
Toomey said he has had conversations with his GOP colleagues in the House. "I know there are a substantial number of House Republicans who are supportive of this approach," he said. Reps. Mike Thompson, D-Calif., and Pete King, R-N.Y. announced Wednesday they will introduce legislation in the House similar to the Toomey-Manchin deal. King's office confirmed to CBS News that King has not spoken with Boehner about this. "Moving forward we will continue working with our colleagues on both sides of the aisle here in the House, and plan on introducing similar legislation to require comprehensive and enforceable background checks on all gun sales with reasonable family and friends exceptions," Thompson and King said in a joint statement. New York City Mayor Michael Bloomberg, who has pressed for new gun control measures as co-chair of Mayors Against Illegal Guns, released a statement commending Toomey and Manchin for forging a path forward. "Over the last few months, Americans across the country and in both parties have demanded that those in Washington take commonsense steps to keep guns out of the hands of criminals and the seriously mentally ill," he said. Even as the legislation makes progress, both Toomey and Manchin acknowledged Wednesday that they themselves could end up voting against the bill ultimately produced during Senate debate. "I'll make my final judgement when I see the final product," Toomey said. Manchin said, "I cannot support [the final bill] without the amendment that Pat and I have worked on." While the GOP-led filibuster against gun legislation looks broken for now, at least one Republican said Wednesday that their opposition to the discussed reforms still stands. "Along with a number of my colleagues, including the [Senate Minority Leader Mitch McConnell, R-Ky.,], I have declared my intention to resist an immediate vote on any new restrictions that would serve primarily to limit the freedoms of law-abiding citizens rather than reduce violent crime," Sen. Mike Lee, R-Utah, said on the Senate floor. "Unfortunately, the current gun control proposals would do just that."